Wieland's production of Parsifal offended the sensibilities of the traditional Wagnerians, to a degree scarcely imaginable today. The production left them with no visual reminders of the pieces they thought they knew: they were confronted with emptiness and darkness, with just a few abstract topographical hints as to what was happening on the stage. The outrage was fierce. 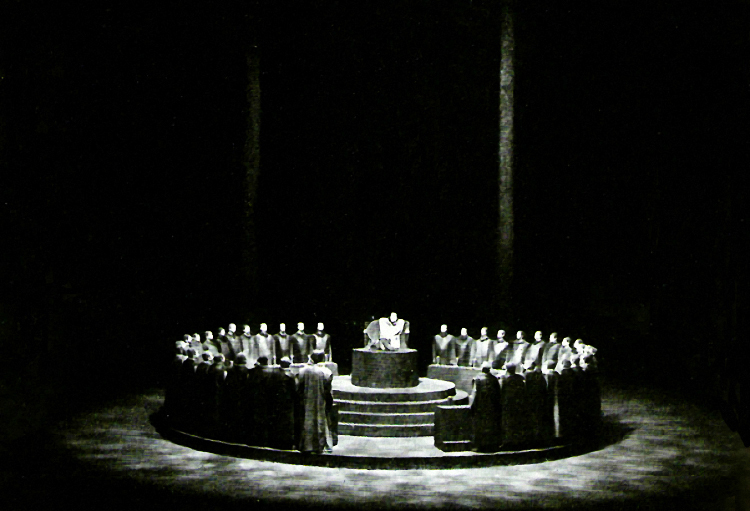 Old Wagnerians formed a "Club for the Faithful Rendition of Richard Wagner's Works..."
Wieland Wagner's stunning set and lighting design for his 1951 production of Parsifal. The opera that re-opened the Bayreuth Festival after the war, and paved the way for his "New Bayreuth" style. A Wieland Wagner Portrait. This is a documentary which includes interviews and rehearsal footage of the director, as well as conductors and singers that worked at the Bayreuth Festspielhaus during the Wieland Wagner years. The film is in German with no subtitles, and it is narrated by Theo Adam. 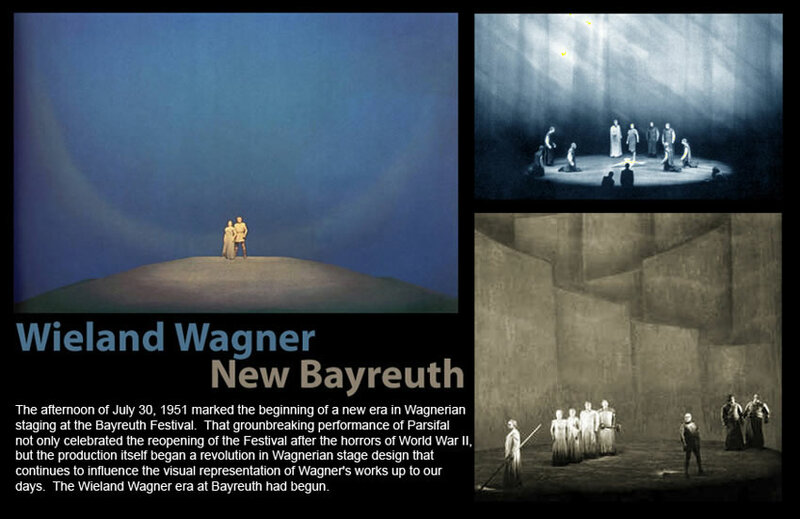 At the Bayreuth Festspielhaus Wieland Wagner achieved amazing stage pictures in his productions of the Ring. 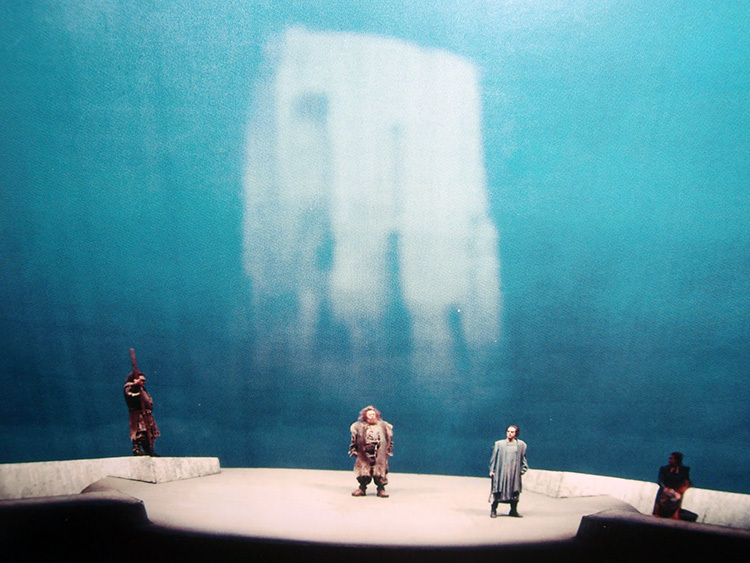 In the above scene from Das Rheingold, the use of empty spaces suggests a classical mythical world. The projection suggests the ramparts of Valhalla. Wieland was trained as a painter, and this production clearly shows his ability to paint with light in order to create amazing worlds. 1. The frequent use of a circular acting area. 2. The inventive use of light to set a psychological rather than temporal setting. 3. The simplication of costumes, away from the Germanic excesses of the pre-World War II era. 4. The lack of elaborate sets in favor of emptiness and darkness. 5. The transformation of characters from pseudo-humans into symbols. 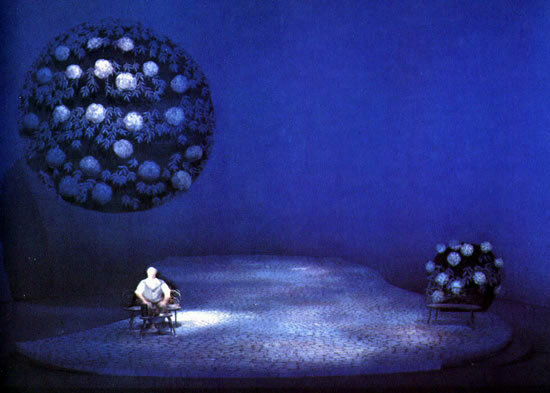 Wieland staged Tristan und Isolde for the first time at the Bayreuth Festival in 1952, and again in 1962. The first production featured a Third Act staging which did away with Tristan's castle, the lime tree, and the rest of the clutter of the 19th century, and replaced it with barren scenery of unbelievable bleakness and despair. 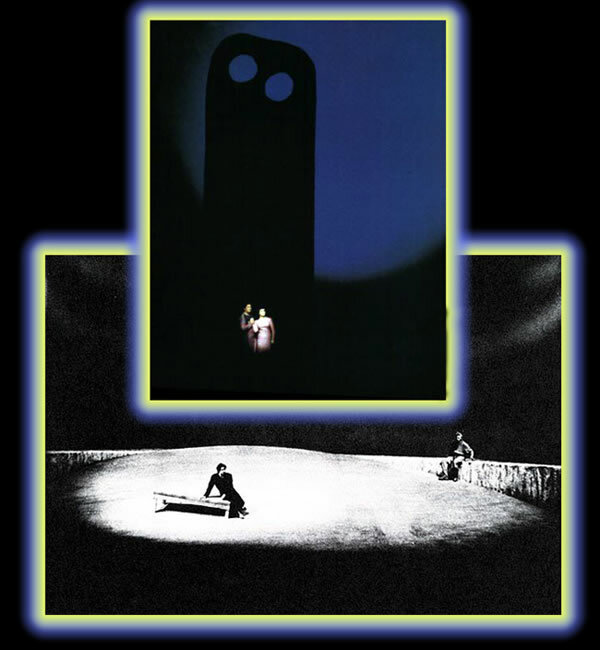 Ten years later, his 1962 staging remained as bleak as ever, but this time he added huge monolithic structures to every act. The monoliths were conceptually Celtic in design and essentially Freudian. Stage piano rehearsal footage of Wieland Wagner's 1960 production of Die Meistersinger von Nürnberg featuring Elisabeth Grümmer as Eva, Elisabeth Schärtel as Magdalena, Josef Greindl as Hans Sachs, Wolfgang Windgassen as Walther, Karl Schmitt-Walter as Beckmesser, Theo Adam as Pogner, and Gerhard Stolze as David. This production was conducted by Hans Knappertsbusch. Wieland's 1956 production of Die Meistersinger von Nürnberg caused the greatest consternation to the Bayreuth Wagnerian old guard. Click here to find out more information about this production. Remarkable footage of several Wieland Wagner productions, as well as a rare chance to see and hear the director at work with Hermann Prey, as he directs him in the staging of "0 du mein holder Abendstern." Wieland Wagner was often acussed of designing productions that were bloodless -- beautiful to look at, but intellectually mannered and ultimately cold. 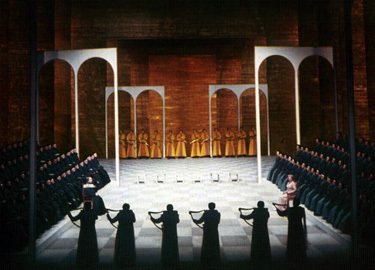 Pictured here is the second act of his 1954 production of Tannhäuser, starring Gré Brouwenstjin and Ramón Vinay. It was set in a highly rigid world where the floor resembled a chess board, and the singers were placed in geometrically precise patterns. The chorus, in particular, no longer seemed to be medieval courtiers from a European opera, but rather a solid block of sculpted figures from Greek drama who moved with regimented discipline. In addition, many critics further accused the designer/director of staging oratorios and not operas. Indeed, many thought that the logical culmination of his style would be to present the operas in concert performances. 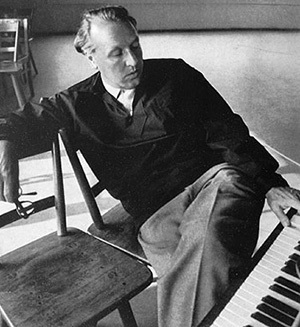 A year before his death, Wieland Wagner rehearses his 1965 production of Das Rheingold at Bayreuth. The cast included Theo Adam, William Olvis, Ursula Boese, Wolfgang Windgassen, Erwin Wohlfahrt, and Gustav Neidlinger. Alfred Walter is seen at the piano. This production was conducted by Karl Böhm. 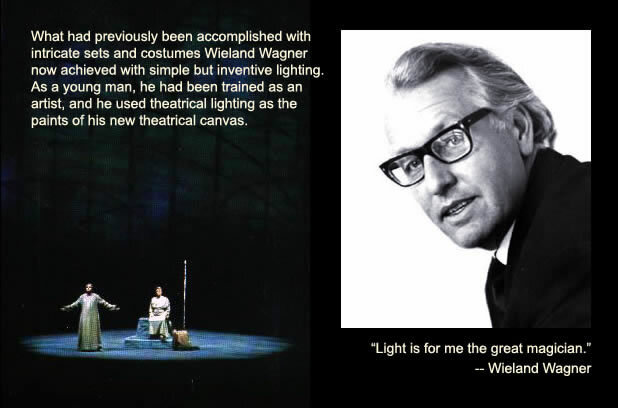 Wieland Wagner was artistic director at the Bayreuth festival from 1951 to his untimely death from lung cancer in October of 1966. His last hours he spent discussing, as best he could, plans for a new production of Tannhäuser.